I’ve been MIA for a bit – not because I haven’t been working on genealogy though. Quite the opposite, I’ve been putting together family tree books for cousins with the photos of all the original images that prove the names and dates and places of our ancestors. I’ve also been focusing more on the US families in the last month or two. They say genealogy is the one hobby that as you get better, it gets harder. Well, my experience has proven that’s definitely true, whether you’re going back to the 1700s or tracing a family to the US and following his descendants up to the present day. And I try to stay extremely organized, or else things get very confusing! That’s not even the whole thing! Or else the image would have been way bigger. 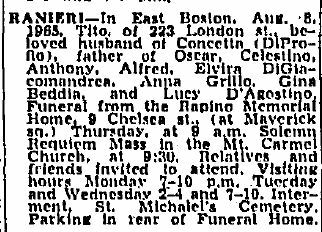 He married Concetta di Profio on 27 Jul 1908 in Boston. Once I started learning about the Civitaquana families, it became obvious Concetta was also from Civitaquana, and so I’ve been researching her family for my cousins as well to include in the family book. She was born 22 Nov 1890 in Civitaquana. No surprise that Tito and Concetta have many common ancestors in Civitaquana when you go back far enough! They had their first child, Elvira, on 12 Jul 1909 in Boston, and then returned to Civitaquana shortly thereafter. I only found this out because on their original birth records it was stamped saying that they got married in Civitaquana in 1910. That was curious, since I had already found their marriage in Boston in 1907! 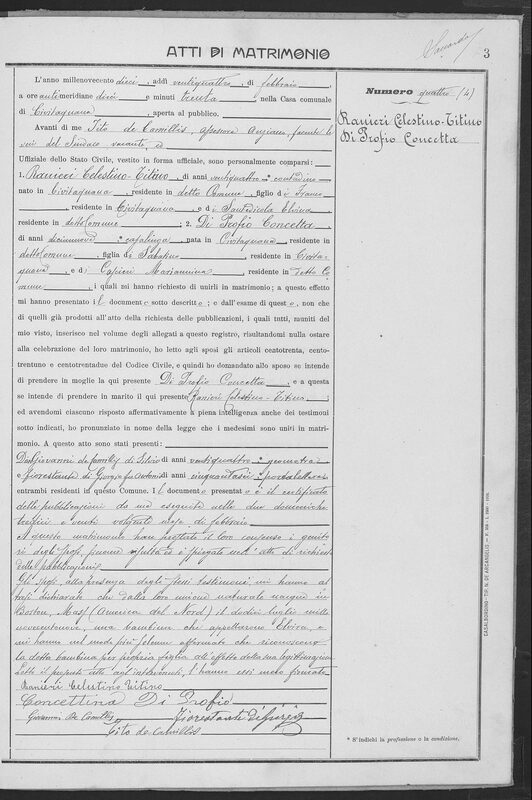 I guess it wasn’t considered a legitimate marriage until a ceremony was held in the mother land, because on the bottom of the Civitaquana marriage record it says their daughter Elvira was a “natural” child – aka biological but not legitimate as if they weren’t married, and that this marriage legitimized her. You can imagine how challenging it was to figure out how many children each of their kids had – which required tracking down obituaries for all the children and their spouses. This is why I do this though, the satisfaction of completing a family and knowing who all of your cousins are! It also wouldn’t have been possible without the help of a few cousins in that family. I’ll be posting a few more stories like these for other Nocciano and Civitaquana cousins that I’ve been researching. Eventually I hope to have a whole section of the site devoted to our cousins who came to Massachusetts and their families.